Visit our onesie sticker design gallery and choose your design. You will receive 12 - 4" vinyl glossy waterproof stickers (other sizes and shapes are available - email us for pricing). Our stickers are made from a glossy vinyl material and are completely waterproof! They will not fade, smear, run, etc... no matter how much your little one drools on them ;) They come packaged in a clear package with a glossy color insert including instructions - ready to give as a gift! 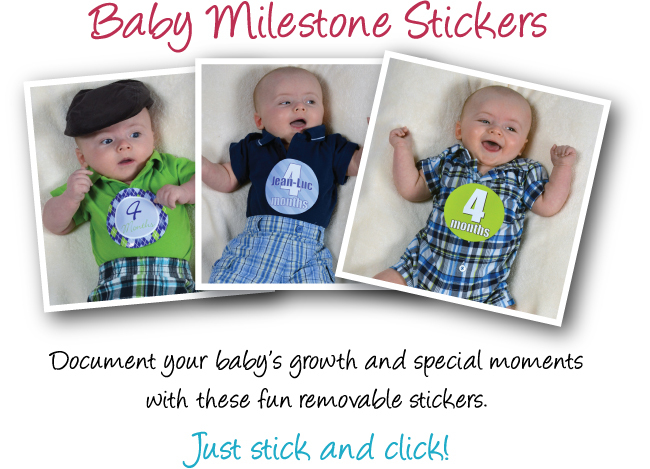 Our waterproof glossy monthly onesie stickers are the perfect gift for any new mom or yourself! These stickers make great photography props. Just peel and stick to your favorite onesie or tee and your little one is camera ready! Or stick to a wood block, pillow or other photo prop ... the possibilities are endless!! --ADD-ON's-- We will match the design of the add-on's to the design purchased. 'Add to Cart' your selections and fill in the 6 digit design number (ex. M001-01). If your design includes a name that needs to be personalized, please put the name in the note to seller at checkout. Onesie stickers ship in approx. 1-7 business days by regular USPS First Class Shipping. If you'd like to upgrade to 2-3 USPS priority domestic shipping with delivery confirmation for an additional $3, please 'add to cart' Priority Shipping upgrade with your order. This will only change the shipping method, not the processing time. International orders are shipped by regular USPS mail. Shipping to most countries take approx. 6-10 business days (could be longer depending on the country and its postal system). If you'd like a different method, or have any questions about shipping, please contact us in advance. We are NOT responsible for lost or damaged items shipped by regular First Class shipping. You can also visit our Etsy shop to purchase from there.